Hanoi (VNA) – The Vietnamese Government has always encouraged and given support to foreign enterprises, including Microsoft, to expand their investment in the Southeast Asian country, Deputy Prime Minister Vu Duc Dam has said. Hosting a reception for President of Microsoft Asia and Corporate Vice President of Microsoft Corporation Ralph Haupter in Hanoi on January 16, Deputy PM Dam spoke highly of Microsoft’s strategies and commitments in the Vietnamese market, as well as its cooperative programmes with competent ministries and branches in the country. 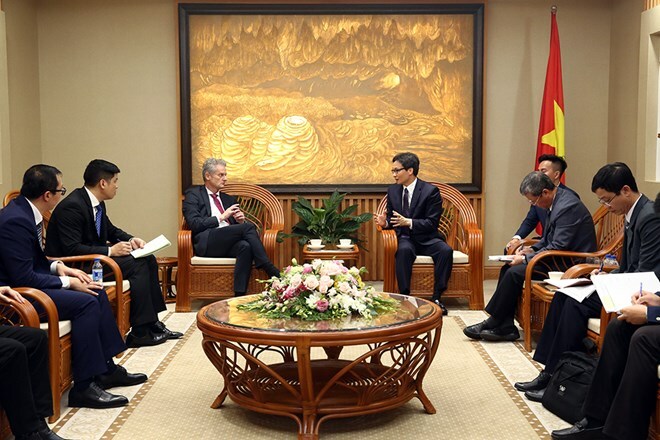 He expressed his hope that the US technology company will outline more policies that fit the Vietnamese market, which he encourages to use copyrighted software, and help Vietnamese organisations improve their capacity in ensuring cyberspace security and digital transformation. Dam wished that the firm would make significant contributions to Vietnam’s targets in infrastructure development, including IT infrastructure, human resources training, and enhancing public IT access. Ralph Haupter, for his part, said that with robust growth in various sectors, Vietnam has been attracting several of the world’s technology giants, including Microsoft. Present in the Vietnamese market since 1996, Microsoft’s products have been used by the majority of state agencies, local enterprises, and the local population. In addition, the corporation has contributed 22 million USD worth of software and cloud computing technology, as well as more than 3 million USD to support Vietnam’s educational and social activities.